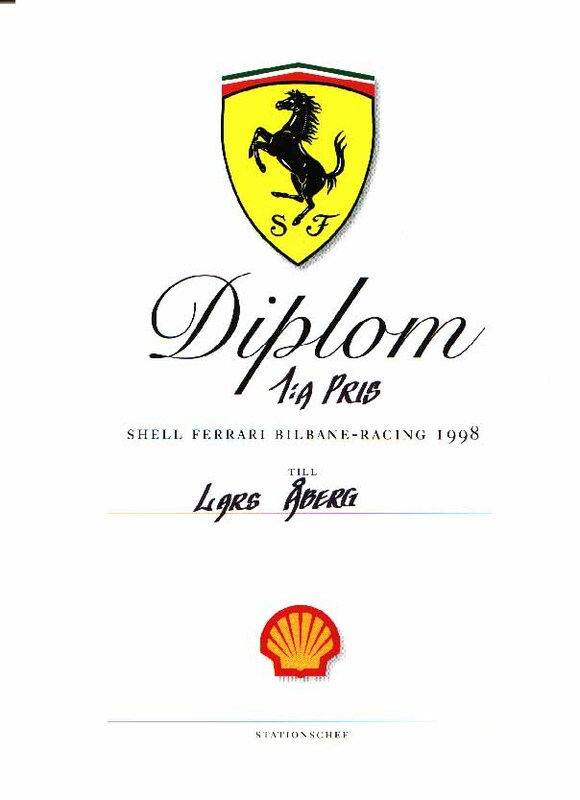 During 1998 the Gasoline Company Shell had slotcar races at their gas stations in Sweden the same day there were a Formula 1 race somewhere in the World. Shell had put together a lot of plastic tracks, Scalextric I believe, and those tracks were present at a dozen different locations every Sunday when there were a F1 race going on. The idea was that their customers would pay 10 SEK (US$ 1,3) and for that the customers got 1 Ferrari toy car (There were about 10 different ones) and 2 minutes of racing on the track and Shell a lot of publicity. The total winner got a trip to a Formula 1 race. Since they used normal home car sets the tracks that were build up differed a lot and of course, the cars used differed a lot so it's not really fair to compare results done on different tracks to each other, but it was fun. One unfair thing was that on some places you were not allowed to do a single lap to try the track or car while on another places you could try which car or lane that felt the best. In Shells rules it was said that no one could do more than 10 races. If he or she had done more they could not be part of the big price, the trip to a F1 race. I obeyed these rules but I know some people that didn't. A rumour says that one slotracer has more than 40 of these toy cars at home so that means that he, or his wife, has done more than 40 races. How did it turn of for me? Well, the first time I heard of this I came after the F1 race on TV was over and it was almost to late, just before they were closing down and I did two races. The first race I slipped once but still had the second best result of that day on that station. On my second try I raced cautious, and slow. I didn't do any mistakes but I didn't go faster either. The last racer of the day was the fastest one. On both his tries he was the best. I asked him about it and he said that his kid had a track at home and, as a good father, he plays with him. The guy that came home second had done numerous of good races and I would se more of him later. I ended third and got some cash and Ferrari candy. A few weeks later they had a race in my hometown and at some other stations close by. The track felt awful but I made the best race of the day on that track. I visited a second track were I also won and then I went to the third track. That track felt really good and I was the best there and I had done my 10 races. Second and that time was the same guy that had been second a few weeks earlier. When he saw that he wasn't in the lead he didn't cared about doing only 10 races and made another race or two until he was the best there. When I spoke with him it turned out that he was a slotracer from the 70:ies. The winner totally in Sweden was someone from Tranås, I do not know his name, that had been at a gas station in Oskarshamn (close to Mönsterås) and have seen a track and just tried it. He wasn't any slotracer or so just found a good track and had some luck as well. This thing that Shell did was quite good. If someone, a slotracer or van Rossem had time and knowledge to talk to Shell or other companies and maybe influence them in doing something like this but on better tracks and equipment I believe that slotracing could have a small boom again. I do not know how the result for Shell businesslike were, but repeating what they did and maybe add that their customers could meet last year winner, or something like this, could add to their publicity. Anyhow, I got my candy, cash and a diploma.